The competitors who passed the first round of proposal screenings pitched their ideas in front of a panel of judges. Along with a monetary prize, winning teams also received the chance to collaborate with mentors and consultants to actualize their projects. The competition was divided into two categories: Service (Real-life Business) and Products (Sharing Technology). The winner of the Service category was the Sign Language Translator Team, who developed an app to overcome the difficulties in communicating through sign language, as it does not follow a standardized grammatical structure. The app, called Son-cance (“Hand-vacation”), helps those with hearing impairments communicate with ease even when traveling abroad. The app uses both sign language cues and English to translate conversation and even suggests appropriate responses. To accommodate users, the app also incorporates a drawing feature and a Yes/No option to facilitate interpersonal exchanges. In the Products division, the Players Team took first prize. While welfare for the disabled tends to focus on daily necessities, this team instead created a board game, aiming to enrich the emotional well-being and quality of life of its users. The team hopes to diversify the Korean board game market, which is currently very limited and costly. The Players Team used 3D printers to create a deck of braille playing cards, and they hope to create 300 sets and send them to welfare agencies for the disabled. 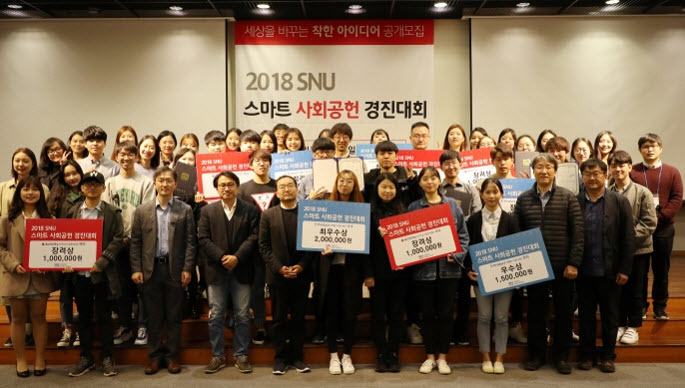 More information on the 2018 SNU Smart Social Contribution Contest can be found at the IGSR homepage, http://snusr.snu.ac.kr.